Liver disease leads to over 4 million visits to medical practitioners and over 750,000 hospitalizations per year in the USA. Those with chronic liver disease frequently progress to cirrhosis, end-stage liver disease (ESLD), hepatocellular carcinoma, and death. Patients with ESLD experience numerous complications, including muscle cramps, confusion (hepatic encephalopathy), protein calorie malnutrition, muscle wasting, fluid overload (ascites, edema), bleeding (esophagogastric variceal hemorrhage), infection (spontaneous bacterial peritonitis), fatigue, anxiety, and depression. Despite significant improvements in palliation of these complications, patients with liver disease still suffer reduced quality of life and must confront the fact that their disease will often inexorably progress to death. Liver transplantation is a valid option in this setting, increasing the duration of survival and palliating many of the symptoms. However, many patients die waiting for an organ or are not candidates for transplantation due to comorbid illness or psychosocial issues. Others receive a transplant but succumb to complications of the transplant itself. Patients and families must struggle with simultaneously hoping for a cure while facing a life-threatening illness. Ideally, the combination of early palliative care with life-sustaining therapy can maximize the patients’ quality and quantity of life. If it becomes clear that life-sustaining therapy is no longer an option, these patients are then already in a system to help them with end-of-life care. National Health Service. 2017. http://www.nhs.uk/Planners/end-of-life-care/Pages/what-it-involves-and-when-it-starts.aspx. Last accessed June 2017. World Health Organization. Palliative Care. 2017. At http://www.who.int/ncds/management/palliative-care/en/. Last accessed 21 Jan 2018. World Health Organization. 10 Facts on the state of Global Health. 2017. http://www.who.int/features/factfiles/global_burden/en/. Last accessed January 2018. World Health Organization. 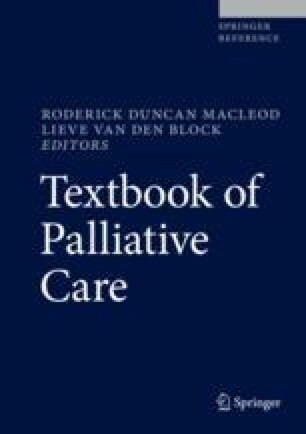 WHO definition of palliative care. 2017. http://www.who.int/cancer/palliative/definition/en/. Accessed 21 Jan 2018.